Most orchid growers agree that in winter orchids should be watered in the morning, preferably on sunny days when the temperature is rising, so that the foliage is dry by nightfall. Watering in summer is more controversial. For a typical summer day in Melbourne with a maximum temperature around 25°C, I stick to the winter schedule and water in the morning. Foliage that remains wet overnight is prone to fungal attack, especially if the relative humidity is high. Glasshouses and other enclosed structures are always humid at night when the temperature falls. Watering in hot weather, when temperatures exceed 30°C, and especially when hot, dry northerly winds are blowing, is another matter. Under these conditions small pots watered in the morning will be dry by midday. Watering in the evening is then much better, as the plants have all night to absorb water through their roots. If the weather is very hot, I water my small pots (up to 50 mm in diameter) both in the morning and at night. 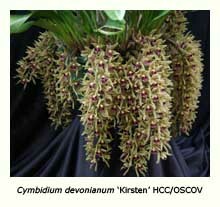 The above comments refer to plants, such as Australian native dendrobiums, grown in bark-based mixes. Plants grown in Sphagnum moss retain moisture much longer and seldom need watering more than once every second day, even in the hottest weather. Some orchids, such as dendrobiums and varicosum-type oncidiums, like to dry out between waterings, whereas cymbidiums and paphiopedilums do much better if their potting mix is never allowed to become completely dry. There is an added benefit to watering cymbidiums at night in summer. The cooling effect produced by watering at that time induces flowering. Temperatures need to fall to 13°C or lower over a succession of nights in December and January for this to happen. 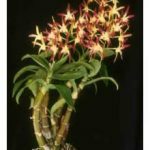 The required cooling effect is fairly easy for us to achieve but not for Brisbane growers, who have great trouble in persuading many of their cymbidiums to bloom. 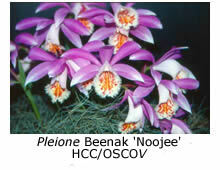 One genus that definitely benefits from watering at night is Pleione. 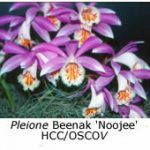 Max Akam, one of Melbourne’s largest pleione growers, always waters his plants at night, and believes it is particularly important in hot weather. 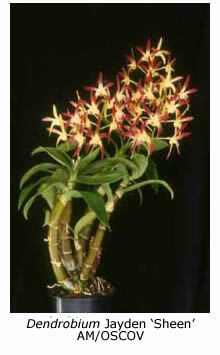 Some growers with heated glasshouses water the orchids therein in the evening all year round. Their rationale is that rain falls mainly in the late afternoon or evening in the tropical regions where most of their species orchids grow, and that they are doing only “what comes naturally”. However, unless the minimum temperature is about 15°C and there is excellent air circulation, I believe that watering at night throughout the year will ultimately lead to attack by Botrytis and other fungal infection. No orchids should be watered at midday in very hot weather. 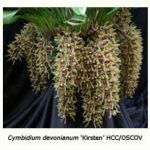 Soft-leaved orchids, such as lycastes and pleiones, will suffer from leaf scald, and so may the new growths on soft-cane and Australian native dendrobiums. Also, it’s best not to apply liquid fertilisers in hot weather, and preferably not when the roots are dry. Always ensure that the potting mix is damp before applying liquid fertilisers, or you may damage the roots (this advice has been handed down by a long line of expert orchid growers but may not be scientifically based). I prefer to play safe and water one day and fertilise the next. By choosing a cool spell of weather, then it won’t be necessary to water for another couple of days. This allows time for the nutrients to be absorbed by the plant before they are flushed away with the next watering. Whatever your watering technique, the most important thing to your plants is that they are watered. The effort that you put into your cymbidiums during summer will be reflected in how well they flower in winter and spring. So give them a Happy Christmas too, and water them regularly over the holiday season.